High Cholesterol (Hypercholestrolemia) | Infonet Biovision Home. LDL is referred to as "bad" cholesterol. High levels may form fatty deposits in the arteries. HDL is known as the "good" cholesterol; it helps to remove excess LDL from the blood stream. Transport Fat in the Blood Stream. You probably know your blood pressure, cholesterol level and maybe even your blood sugar - but what about your triglyceride level? While they get less attention than cholesterol, triglycerides are significantly linked to heart disease. Triglycerides are the main form of fat found in foods, whether they are saturated, polyunsaturated or monounsaturated. Excess calories are converted to triglycerides for storage as body fat. Triglycerides in your blood are usually higher if you are overweight, consume too much alcohol, refined sugars or when diabetes is out of control. A high blood triglyceride level (above 150 mg/dl) is a risk factor for heart disease, so it is a must to monitor your level regularly. The risk of developing heart disease increases as total blood cholesterol, LDL and triglycerides levels rise. Chances of developing heart disease are further increased if there are additional risk factors present e.g. diabetes, high blood pressure among others. The amount of blood cholesterol is influenced primarily by diet, hereditary factors, and diseases such as diabetes. Smoking, obesity, lack of exercise, stress and high blood pressure (hypertension) can also contribute to high cholesterol. In general blood cholesterol levels tend to rise with age. Cholesterol is obtained from animal sources such as dairy, beef, pork, poultry egg yolks, organ meats and lamb products and consumption of saturated fat intake, such as butter, ghee, fatty parts of meat, chicken skin. Trans fats also decrease HDL and may be involved in arrhythmias and sudden hearts attack. Trans fats are found in baked foods, processed foods (sausages, bacon, salami, frankfurters, etc) and shortening. High consumption of sugars, processed foods, alcohol and general starch will increase your triglycerides, which in turn increases your risk of heart disease. Atherosclerosiss which occurs when cholesterol build up mixes up with connective tissues of the blood vessel. This is eventually covered by the smooth tissue and calcium, causing hardening of the arteries. 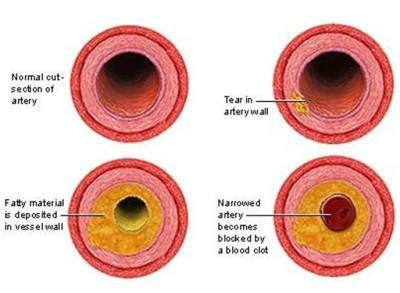 When blood flow is stopped in the coronary artery, it causes a heart attack. A laboratory blood test is necessary to give an accurate indication of cholesterol levels. Generally a blood sample is taken from the arm, after the patient has fasted (gone without food) for at least 12 hours. In some cases, an automated system may be available, which can test a sample from a single pinprick of the finger. Eating high fiber foods such as fruits, root vegetables, pulses and oats and whole fiber cereals (soluble fiber). Include seed and nuts in your diet. Choosing lean meats, trimming away any visible fat, skinless chicken and fish lowers saturated fat intake. Low fat milk, yogurt and cheese are used instead of full fat varieties. Butter is replaced with Trans fat free margarine. Fish oils (omega 3) lower triglycerides, platelet aggregation, decrease inflammatory response mechanisms and lower blood pressure. Polyunsaturated fats (PUFA) i.e. omega 3 and omega 6 such as soy bean, corn oil, sunflower, safflower. Mono-saturated fats such as olive oil, peanut oil, nuts, seeds and avocado lower LDL. However, they do not lower LDL as much as PUFA. Physical activity also lowers LDL as it increases HDL. A high carbohydrate diet substituted for saturated fats lowers LDL. i.e. 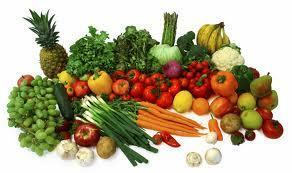 diets rich in complex carbohydrates, fruits, vegetables and grains. However, high carbohydrate diet is not recommended for people with metabolic syndrome because it can worsen triglyceride level, HDL level and insulin resistance. Phylis A. Balch, and James F Balch, Prescription fro Nutritional healing, 3rd Edition.